Powers/Abilities: Seeker's power derived from the Universal Control Rod, which turns a person's nervous system on and off, and also bent others' nervous systems to his will. He displayed no individual power although it may be that he had limited mind control over others and this was augmented through the Rod. He likely had low immunity to disease. He strongly believed in his mission to prevent the secret of the Hidden Refuge being revealed to the outside world. (Marvel Adventures Fantastic Four#27 (fb) - BTS) - Maximus usurped the royal throne of Attilan, wresting control from his brother, Black Bolt. Since then, Black Bolt and his court, including Crystal, Gorgon, Karnak, Medusa and Triton, had been on the run. Maximus dispatched Seeker to find and return them back to the Great Refuge for judgment. (Marvel Adventures Fantastic Four#27) - Seeker manipulated Lockjaw to do his bidding and tracked down the Inhuman Royal Family to New York, where he was appalled by the stench and pollution. He then commanded Lockjaw to teleport them inside the Baxter Building where the Fantastic Four were fumbling in their initial greetings with the secretive Inhumans. Once inside, Seeker demanded that the renegade Inhumans return to the Great Refuge of Attilan by order of Maximus. The others scattered while Triton engaged Seeker in direct combat before being overpowered by Seeker's Rod. Medusa fell the same way while Black Bolt was knocked out. Seeker then had Lockjaw track the other three Inhumans and they came across Crystal next. Seeker used his Rod to control Crystal's mind to attack the Human Torch, but her love for Johnny prevented her from killing him. Meanwhile, the Thing and Gorgon fought in the next room until they crashed through an adjoining wall, knocking out Seeker. The Human Torch then incinerated the Universal Control Rod, thereby freeing Lockjaw and Crystal from his mind control. Medusa later commented that once Maximus discovered that Seeker had failed, he would send other hunters after them. Comments: Created by Fred van Lente (writer) and Cory Hamscher (pencils & inks). He calls Triton as "cousin," so Seeker is logically related to the Royal Family of the Inhumans, but where exactly this Seeker fits is still unrevealed, as well as if the Inhumans' family tree in Earth-20051 (Marvel Adventures) matches that of Earth-616. 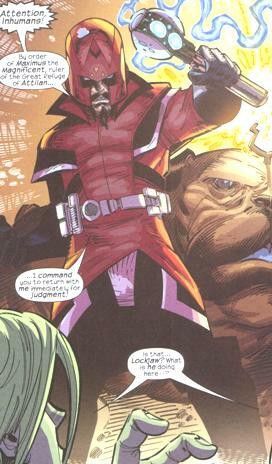 Seeker is similar in appearance to Karnak. He is referred to as both "Seeker" (as his name) and "the Seeker" (as his role). 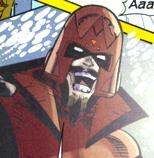 His Earth-616 counterpart has an Appendix profile.